Meet Adam Watson from Against the Grain on Monday, February 25th, as part of the FFB Fringe! Click here for info and tickets to the event at Cloudwater Unit 9. Since the beginning, Against the Grain has been throwing caution to the wind and making beer the way they want. It all started in 2011 with the opening of Louisville’s first brewer owned and operated brewery, Against the Grain Brewery and Smokehouse, in downtown Louisville. While that’s a nice accolade, owners Jerry Gnagy, Sam Cruz, Adam Watson, and Andrew Ott were after much more. They wanted to change the way beer was viewed in Louisville. From day one they promised to produce different beers all the time under an array of styles. This promise was extraordinary, impossible even, to those who believed pale ale should be pale ale and porter should be porter. They were told they couldn’t do it, but with a few crude names and quality liquid they proved everyone wrong. Three years later they found themselves needing some elbow room outside of the brewpub downtown. 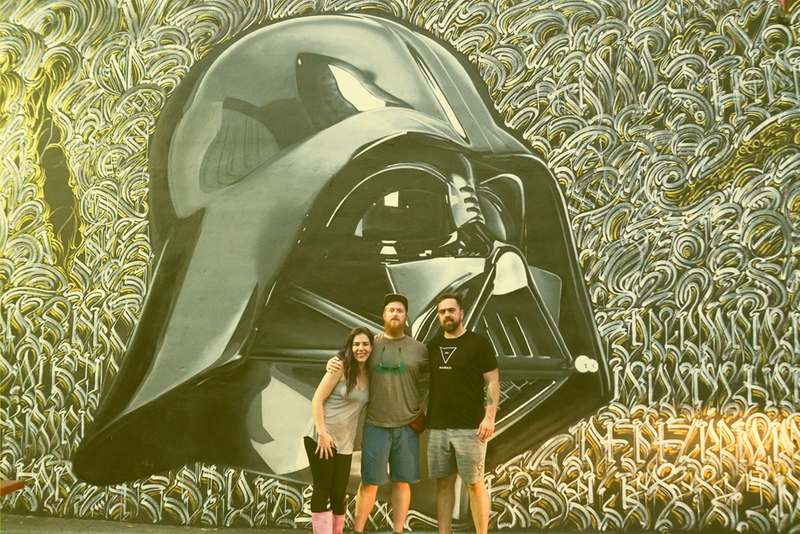 In 2014, they bought a production facility in the Portland neighborhood of Louisville and began producing an eclectic line of canned and barrel-aged beers. They grew bigger, that’s a fact, but they never lost sight of their original promise. They looked to the packaging to tell the story of Against the Grain to with the world. Beers with the merit to laugh in the face of naysayers are now on shelves reaching all four corners of the globe. To date, we've brewed three beers with Against The Grain - the apple pie-inspired Make Apple Pie Great Again, triple IPA Dad Jokes, and a Bourbon BA Kentucky Common. Sample American Solera’s beer as part of FFB Fringe at Cloudwater Unit 9 on Wednesday, February 27th, while taking part in a Q&A discussion on wild and mixed fermentation beers! Find out more and buy your ticket here. The solera method is famous in the production of sherry and other fortified wines, where younger wines are continuously used to top up casks of older wines in order to produce a consistently aged blend. Oklahoman brewers American Solera apply this method to the production of beer and specialise in wild-fermented, oak barrel-aged creations. A relatively young brewery, they were only set up in 2016 but founder Chase Healey comes with an impressive pedigree, having previously acted as brewmaster for another acclaimed brewery based in Oklahoma, Prairie Artisan Ales. Most of American Solera's beers are aged for 6 to 18 months prior to bottling in their collection of foeders, puncheons, and wine barrels, giving each beer its own unique flavor profile. We brewed a collaboration with American Solera while over in Oklahoma earlier this year. The essence of naturalism and conservation sits at the heart of everything Arizona Wilderness do. Founders Jonathan and Patrick are inspired by the landscape and agricultural community of the brewery's vastly diverse home state of Arizona. The pair's love for Arizona has hugely influenced their vision for creating high-quality, artfully-crafted beers. That passion has turned into a mission in which highlighting Arizona’s agricultural community is a root cause. Arizona Wilderness are known for boldly-flavoured beers, from hop-focused numbers to modern interpretations on traditional styles and huge imperial stouts, which make use of locally-sourced sourced ingredients, including Arizona-grown malt, fruits, herbs and nuts. This essence is captured by what is considered their best-known beer, American Presidential Stout, a Russian Imperial Stout made with smoked jalapeños from a local organic farm, smoked over Arizona mesquite wood, and aged on cocoa nibs. We brewed Virga, a sour IPA that used Arizona cantaloupe melons, earlier this year. Situated on a beautiful 4,200-acre estate in Tennessee's Great Smoky Mountains, Blackberry Farm aim to create beers that are rooted in centuries old traditions and respectful of time-honored methods. At the same time, they are constantly exploring new methods designed to enhance the complexity of their beers. With a leaning towards elegant farmhouse styles and Belgian classics, Blackberry Farm design beers for life's moments both big and small, whether celebrating a special occasion, pairing with fine food, recreating, or just enjoying the day. They also reflect their dramatic setting in a series of beers that use ingredients foraged from the estate and draw on Tennessee traditions, including the use of bourbon barrels from local distilleries. Our collaboration with Blackberry Farm, Mockingbirds of a Feather, was released earlier this year. The Bruery's Senior Production Manager Jeremy Grinkey will be joining us at Cloudwater Unit 9 for a discussion of wild and mixed fermentation beers on Wednesday, the 27th of February, as part of FFB Fringe. Click here for more info and to purchase tickets. Taking its name from founder Patrick Rue, The Bruery is a genre-defying brewery from Orange County, California with a big love for barrels. Around half of the beer they produce is aged in wine or spirit barrels from their impressive collection and their beers are brewed to reflect the excitement that Patrick during his early years as a homebrewer - the obession which led him to establish The Bruery. They brew dozens of original beers each year, using an ever-growing list of ingredients and taking in a huge variety of flavour inspirations. Few breweries are as original or as daring as The Bruery and not only do they produce a huge range of styles from Belgian-inspired table beers to wheat wines and huge imperial stouts, they also push the boundaries of what is deemed possible, resulting in a wide number of utterly unique creations. Their separate Bruery Terreux facility is also used as an opportunity to explore the world of sour and wild beers even more and we collaborated with Terreux on our fruited sour I Still Got It this year. Two years ago they launched Offshoot Beer Company to play in the IPA segment as well. Hailing from San Francisco, Cellarmaker have abandoned the common concept of a set production schedule to adopt a philosophy centred on making something that’s not already available. Consequently, they focus on producing beer in small batches, one beer at a time, with the idea they will have much greater scope to constantly experiment with different hops, barrels and yeasts. The three owners, Connor, Tim and Kelly, have been beer lovers since their youth and all three worked at nearby Marin Brewing Company before deciding to strike out on their own. Despite their diverse approach, they have perhaps become best-known for aromatic and balanced pales that are low in bitterness, which showed in the only collaboration we have brewed with them to date. Paul's Boutique Yeast was a hazy IPA fermented with JW Lees yeast that Paul brought with him from Manchester. During that trip, Paul also did his best to set a new record for the number of pints of Tiny Dankster that could be consumed with a 10-day spell, such is the power of their legendary dank and tropical pale ale. Nobody can resist its charms. We’ll have a series of their best, hoppy beers as fresh as you can get them. It’ll be only their second ever UK festival appearance. Beer, art and music converge to form the basis of Collective Arts' unique and slightly unorthodox outlook. Their aim is to foster a community where a range of talented individuals across various fields inspire, and take inspiration from, each other to raise consciousness of the creative community in their hometown of Hamilton, Ontario and neighbouring Toronto. Founders Bob Russell and Matt Johnston's idea was that the beer, devised by Brewmaster Ryan Morrow, would reflect the diversity and imagination of the artists they work with. Their core range covers a range of classic styles from a citrusy blonde to a rich, roasty porter. But their seasonal beers and collaborations provide scope to explore new ideas and flavours, including a coffee-infused hazy IPA brewed with a Brooklyn roastery and the barrel-aged Origin of Darkness series, that has used a number of unusual ingredients, from white miso to lemonbalm. Collective Arts joined us in Manchester earlier this year to brew Lower Than Zero, a kettle-soured Brut IPA. Creature Comforts was founded by a group of folks passionate about starting a craft brewery in Athens, GA, and making the town a beer destination. The first piece of the puzzle was David Stein, then head brewer at well-known Decatur brewpub Twain's Billiards & Tap, who had used the name 'Creature Comforts' for his personal homebrews. He was quickly joined by close friend Adam Beauchamp, who had spent seven years brewing at Sweetwater Brewing Company in Atlanta, local businessman and beer enthusiast Derek Imes, and finally Chris Herron, a Georgia native who had been working for a major alcoholic drinks supplier in Connecticut. The brewery is located in a stunning converted warehouse building in downtown Athens and also recently expanded by opening a second production facility a few miles from its original location. Creature Comforts has quickly built a reputation for clean, sophisticated and balanced beers like their Berliner Weisse Athena, pilsner Bibo, and the hugely-popular IPA Tropicália. They've also gained a series of accolades for their blended and barrel-aged farmhouse beers. Every beer created by De Garde is 100% spontaneously fermented. They do not use laboratory-cultured yeast in any of their beers and instead allow wort to cool naturally in a coolship before being exposed to the yeast and microflora present in the environment around them. After cooling, all of their beer is transferred to oak barrels in order to finish fermenting in its own time. De Garde's beers can spend anywhere from six months to five years in barrels before being packaged. Linsey and Trevor Rogers, the husband and wife team that set up the brewery, draw on time-honoured traditions but also take inspiration from the landsape around them in Tillamook, sandwiched between mountains, forests and the Pacific Ocean on Oregon's picturesque northern coast. Our fruit-infused wild ale Chuckle du Haut was fermented using De Garde's house culture and we currently have another collaboration with them ageing in foeders in our brew house. We also created The Oister with them in Oregon. Evil Twin don't do conventional. From outrageous beers and audacious flavour combinations to the fact that, up to this point, they've not even had their own bricks and mortar, instead brewing at five different breweries around the world. Then there's the brewery name, which is founder Jeppe Jarnit-Bjergsø's way of humourously thumbing his nose at twin brother Mikkel Borg Bjergsø, the owner of Mikkeller no less. Similar to his brother, Jeppe has been gypsy brewing since establishing Evil Twin in 2010 but all that's about to change, with an impressive new facility scheduled to open imminently in Queens, New York. It promises to be a home befitting their beers, which are renowned for being big and uncompromising, often taking somewhat left-field concepts and just making them work in the most spectacular way. Evil Twin are known primarily for their Imperial Stouts, including much loved beers Even More Jesus, Imperial Biscotti Break and Imperial Doughnut Break. We invited Jeppe over to Manchester for our first collaboration in November 2018, a brut slushie inspired by an experiment he and our founder Paul Jones conducted at Trillium's Field Trip festival when Champagne was added to a slushie machine that already contained a fruited sour beer. Try Fonta Flora’s beer as part of a selection of wild and mixed fermentation beers as part of FFB Fringe on Wednesday, February 27th! Click here for more info and to purchase tickets for the event at Cloudwater Unit 9. The soul of agriculture weaves with English tradition and Belgian inspiration in Fonta Flora's beer. They place emphasis on seasonal flora found throughout the stunning Appalachian mountains that are found on their doorstep in North Carolina. This respect of the immediate environment runs throughout their approach, as local artists are used to help conceptualize the notion that fermentation is yet another medium for creating art. As a result, their creations are truly unique, making use of intriguing and little-known ingredients, such as kudzu flowers, paw paw fruit and false pennyroyal. We collaborated with Fonta Flora on Fanny Pack Convention, a DDH mixed-culture saison brewed with native grapes that was released this year. Based out of a characterful Victorian house in Ambler, PA, Forest & Main is not your typical brewery. Founders Daniel Endicott and Gerard Olson have created a project that's part brewery, part pub and part art project. Named after the two intersecting streets on which the brewpub sits, Forest & Main have developed an image that feels unconstrained by traditional boundaries, forged by Dan's creative mind (his hand-drawn labels adorn each beer they produce). But that has translated to the beer too, which is equally treated as artistic expression with the power to impart strong emotions in the recipient. Having learned to brew on these shores, Dan is inspired by traditional English styles, while Gerard leans more towards Belgian standards. As a result, Forest & Main brew classic cask mild alongside a series of sophisticated and accomplished saisons. Their appearance at Indy Man Beer Con 2017 as our guest was one of the undoubted highlights of that year's festival. Our relationship has resulted in three beers; Wind Suit brewed in Manchester, and A Day I've Never Been To and Ghost Notes in Ambler. Green Cheek might be one of the youngest breweries at Friends & Family & Beer but don't take their lack of years as a lack of experience. 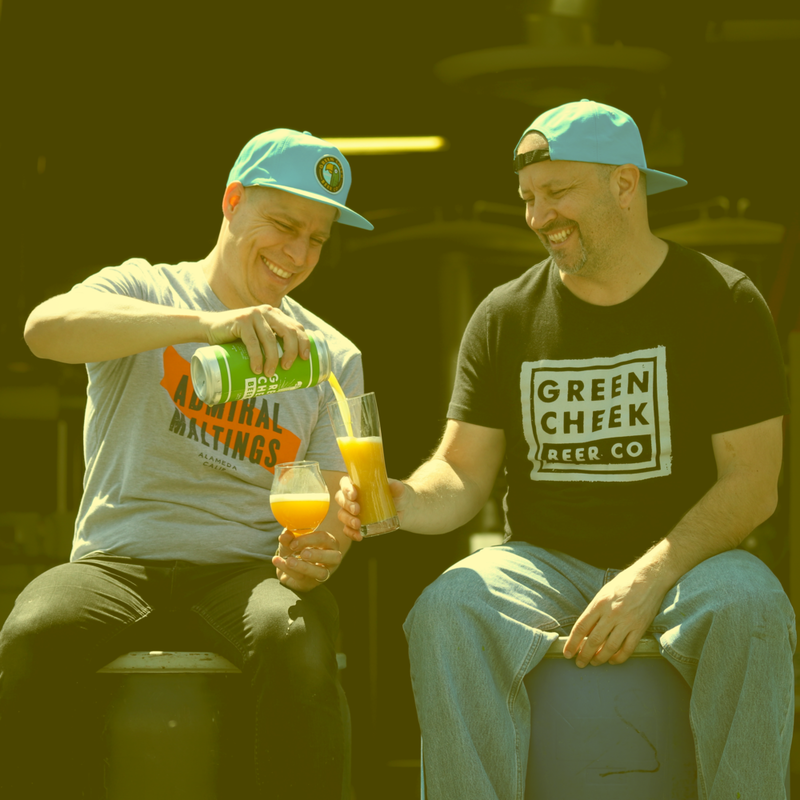 Good friends Evan Price and Brian Rauso started Green Cheek in April 2017 after previously working together at Anaheim's Noble Ale Works, where Brian had acted as CFO and Evan had spent five years as head brewer. During his tenure at Noble, Evan had grown to become something of a legendary figure in southern California's beer scene, transforming a struggling start-up into a destination brewery through a succession of experimental, creative and, most of all, fun beers that successfully captured drinkers' imaginations. The same approach has been applied at Green Cheek, where putting a smile on people's faces is one of the primary goals. There are no constraints to the beer they produce, with their range covering everything from refreshing Radlers and classic Lagers to hazy IPAs and fun adjunct beers like Cocohut, their DIPA brewed with lactose and toasted coconut shreds. We've brewed one collaboration with Green Cheek, a Bourbon barrel-aged stout which is yet to be released. Half Acre are Chicago and Chicago is Half Acre. When exploring the Windy City's independent brewing scene, it's hard to think of a better place to start than the North Side brewery. Since opening up in 2008, they've become hugely respected, not only in their home town but also the wider beer world, and it's not hard to see why. Beers like their session pale Daisy Cutter and IPA Vallejo stand out as stunningly clean, balanced and thirst-quenching representations of their respective styles - the kind of beers you can go back to day after day. But they certainly aren't limited to those easy-drinkers and also produce a series of big, intensely-flavoured DIPAs, TIPAs and Imperial Stouts that allow them to really push the boundaries. Since opening a new production facility in Balmoral in 2015, there has also been an increased focus on mixed-fermentation, with the original brewery in Lincoln housing this more experimental arm. Half Acre's Wyld programme is producing a range of delicious creations, included fruited wild ales, mixed-culture beers fermented in oak, and blended sours. 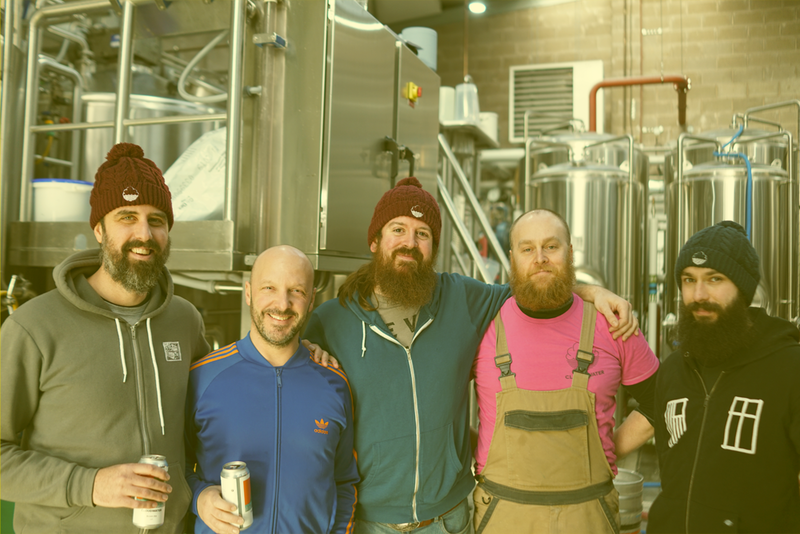 Half Acre joined us in Manchester to brew A Tool For Conviviality, a heavily-hopped Triple IPA, in early 2018. Vermont's Hill Farmstead was started in 2010 by Shaun Hill on his family's 230-year-old farm. The brewery's logo was retrieved from a sign that once hung in his great-great-great-grandfather's nearby tavern, in the early 1800s. Hill Farmstead's approach is billed as the culmination of many years of travel and insight, of experience and education, of friendships and explorations. Shaun returned to Vermont to set up the brewery after honing his trade during stints at two breweries in Denmark. The beers, which run the full stylistic gamut—hop-focused pales, farmhouse styles, oak-aged lagers, and barrel-aged wild ales—reflect an unwavering commitment to improvement and refinement, finding harmony between bold flavour and nuance. As a result, Hill Farmstead are regularly recognized as one of the best independent breweries in the world, and we're incredibly fortunate to welcome them to Manchester for a rare festival appearance. John Wakefield's journey started with a humble Mr Beer homebrew kit before quickly accelerating to the point where his brewery is now viewed as one of the best producers of imperial stouts and Berliner weisse in the world. Even before opening the brewery, John's beer had been turning heads, earning him numerous home brew awards and recognition within Florida's craft beer community. 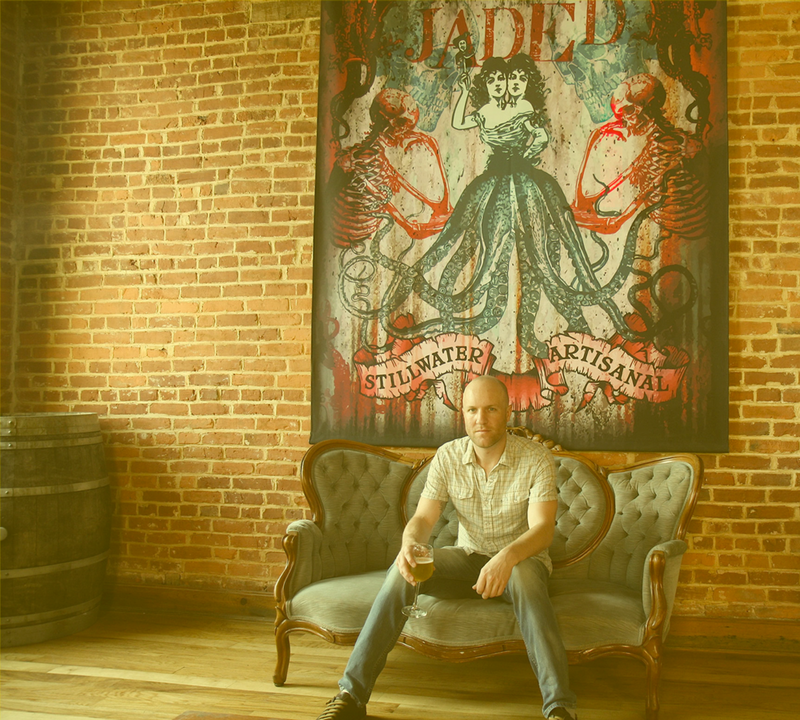 So, when he decided to raise $55,000 via crowd-funding to open his own brewery, he hit the target within 30 hours and J Wakefield Brewing was born in January 2015. Since then, with the help of Head Brewer Maria Cabre, they have gone from strength to strength, helping put Miami firmly on the map as a craft beer destination. J Wakefield are known for delivering seriously flavour-packed beer, from award-winning fruited Berliner weisse Dragon Fruit/Passion Fruit (DFPF), to a succession of rich, barrel-aged imperial stouts. They're also not averse to using unusual ingredients in classic styles, such as their coconut-infused hefeweizen El Jefe. We've worked with J Wakefield on two beers in Miami - What U NNeed and I Get Murky - while we produced the much-loved Pulse 8 in Manchester, as well as two barrel-aged variants of the base beer for Pulse 8. Modern Times describe themselves as an intrepid cadre of brewers, coffee roasters, and culinary wizards, named after a beautifully crazy utopian community founded in 1850 that attempted to create a less exploitative, more pleasurable world. Founder Jacob McKean chose this name due to a fascination with the colorful, ambitious little pockets of history that develop in the folds of progress, and the forgotten little paradises that barely register in the onward rush of civilization. Modern Times attempts to be one of those pockets and almost all of their beers are named after real utopian experiments or mythological utopias. They are intent on creating aroma-driven, complex, flavorful, sessionish beers, but 'dankness' is also a common thread you'll find associated with Modern Times. They're certainly not an East Coast haze brewery, but they produce beers full of punchy hop flavours and sours loaded with tart and juicy fruits, alongside a range of other styles and category-defying mash-ups. We've already brewed four beers with Modern Times - Lipids and Proteins and Biscuit Town in Manchester, as well as Roots of Coincidence and Echoic Memory in San Diego. Husband and wife, Henry and Adriana Nguyen, set out in 2012 with the intention of creating an American sour brewery in Torrance, just south of Los Angeles. But things didn't go quite to plan. Without the funds to invest in barrels from the outset, Henry instead focused on perfecting core Belgian styles, such as blonde, dubbel, tripel, and saison. But the brewery did not produce a single IPA during its first four years, which is pretty remarkable considering this is the style they are now most famous for. Monkish are widely regarded as one of the best producers of hazy IPAs and DIPAs on the planet, but these beers sit comfortably in their range alongside inventive twists on Belgian classics and a delicious range of barrel-aged Saison and wild ales. We headed to Torrance to brew Wrap Your Troubles In Dreams earlier this year, but we've also worked with Monkish as part of two five-way collaborations that also included Other Half, Trillium and The Veil. In 2014, Sam Richardson, Matt Monahan and Andrew Burman founded Other Half Brewing Company, a local brewery in New York City with a simple mission: to create beers that they wanted to drink from a company that they wanted to be a part of. Their vision was to build a passionate team that brewed great beers in the state of New York, done so with effort and thoughtfulness, to represent the 'other half' of the industry. Known for hazy, juicy and full-flavoured IPAs, Other Half are also dedicated to collaborating with breweries both in New York as well as across the world in an effort to constantly move the industry forward while elevating the craft. They believe that local breweries play an important role in their communities, which is why they partner with these other likeminded brewers in local nabes across the country and the world. Fitingly, then, we've collaborated with Other Half more than any other brewery, creating Tremendous Ideas and TM Life at our Manchester brewery and a further seven in New York. Kolsch with lactose, pineapple and coconut. Started in 2010 as the brainchild of renowned electronica DJ and producer Brian Strumke, Sillwater Artisanal is far from a conventional brewery. Drawing on his experience of using various recording studios to produce music, Brian became one of the world's first gypsy brewers, creating beers at other breweries around the world rather than owning his own facility. Designing nouveau translations of existing beer styles, Stillwater became known for their often odd concoctions and unconventional brewing methods, making heavy use of herbs, spices and wild yeasts. Little has changed on that front. Beers like Moneytree$, a Gose-style Session India Pale Ale, highlight an unwillingness to stick to existing style guidelines, and in-keeping with this attitude, we collaborated with Stillwater to create a fruited sour pilsner, Tangible Object, this year. Stillwater are about more than just beer though, operating as an art project/collective where collaborations with other like-minded visionaries lead to boundary-pushing concepts and creations. This was highlighted by their recent collaboration with rapper Action Bronson to create 7000, a dry-hopped sour with muscat grapes, designed to evoke the natural wines that Bronson loves. In their own words, JC and Esther Tetreault started Trillium as 'a young dumb couple in love, planning their wedding and dreaming about how they would spend their lives together'. For them, starting a brewery was about more than just making beer, it was about creating a way of life and building a community with which to share experiences. As both a beer geek and botany nerd, JC chose the trillium flower to represent what the brewery team strive to achieve in both their beer and their lives: beauty, strength, simplicity, and balance. Based in the Fort Point neighbourhood of Boston, Trillium takes inspiration from the heritage of farmhouse brewing methods and the wealth of ingredients available throughout New England - as well as from an ethos of modern re-invention. Undoubtedly, they have become well known for hoppy beers like Vicinity, Melcher Street and Congress Street. We've brewed two collaborations at Trillium’s Canton brewery, Exchange Student and High Fashion, as well as three five-way collabs that also included Monkish, Other Half and The Veil. They’re great friends, that have extended their hospitality on several stays with them at their home, welcoming us not just into their brewery, but the heart of their family life too. We’re incredibly excited to share some of Trillium’s freshest hop-focused creations with you in March. You’re unlikely to get many other opportunities to try their beer in the UK throughout 2019. Self-confessed 'style blasphemers and category agnostics', TRVE create beers that can't always be easily defined. When Nick Nunns set up the Denver brewery in 2012, they swam against the tide in the Mile High City - a place that was defined more by hop-focused beers and an outdoorsy attitude. TRVE brought darkness where there was once only light. Billed as a heavy metal brewery, they name many of their beers after metal bands and songs, and make heavy use of the imagery and design associated with the genre. But their beers are usually anything but black and instead focus on reinterpretations of European farmhouse tradition, putting a twist on classic saisons and barrel-aged sours. Unusually, their core range is made up entirely of farmhouse-influenced beers - including an oak-fermented, dry-hopped saison and a mixed-culture sour pale ale - and, even more unusually for these styles, they're all can conditioned, undergoing refermentation in the can. TRVE don't play by the normal rules. It's remarkable to think The Veil only opened their doors in April 2016, given the reputation the brewery has developed in that very short time. The trio of Matt Tarpey, Dustin Durrance and Dave Michelow started it up but Matt is the brewing mastermind behind the beer, bringing with him an impressive CV that includes stints at Hill Farmstead and The Alchemist, as well as a couple of short internships at Cantillon. In fact, the Richmon, VA brewery's name is taken directly from Cantillon owner/brewer Jean Van Roy's explanation that winemakers in the natural wine industry refer to the pellicle that forms over wild-fermented beer as 'the veil'. Unsurprisingly, considering Matt's rich and varied brewing background, The Veil cover a wide range of styles and approaches through their output, releasing everything from hop-focused pales and IPAs to lagers, barrel-aged beers, and spontaneously-fermented beers made using the on-site coolship. Their double and triple IPAs - including whiteferrari and, of course, Chubbles - often garner the most attention but they've also gained popularity from fruited kettle sours such as Never Never Again Again and the recent Tastee range. Many of you will already know we have worked together on several versions of the infamous TIPA Chubbles, but we've also collaborated on Pineapple, Taco, and Cat, while The Veil recently created a beer in honour of our founder Paul Jones, called Paul From Cloudwater.